Data | Forging connections between neuroscience, cognition and the wider world. A question closely tied to the issue of prescribing ADHD medication is the actual growth of the disorder. Media reports have cited substantial increases in Ritalin use in the UK, and from looking at prescribing trends in the US one possibility is that the diagnosis of ADHD increases in parallel with growing Ritalin prescriptions. It is particularly important to understand how the increased prescribing of ADHD medication in the UK relates to the actual prevalence of the disorder. However, a key issue in the ADHD debate is whether the diagnosis represents a core developmental disorder. The growth in Ritalin prescriptions and the disproportionately high rates of ADHD in the US in particular have often been used to suggest that ADHD diagnosis is socially motivated. When we look more closely at the numbers around ADHD, however, three important observations emerge. First, we can see that although there has been a consistent growth in ADHD medication prescriptions in the UK, there is no evidence speaking to whether this also corresponds to an increase in ADHD diagnoses. Second, the common perception of the US being disproportionately affected by ADHD is surprisingly unsupported. Rather, we can see that different methods and approaches to ADHD diagnosis are what best explain its relative prevalence. Third, thinking about ADHD as a label for a highly heterogeneous group can perhaps more readily account for the differential rates of ADHD based on the diagnostic criteria used. Has the prevalence of ADHD in the UK increased in line with Ritalin prescriptions? As we saw in our previous blog post, the number of Ritalin prescriptions dispensed in England increased by 156% from 2004 to 2014. However, this does not mean that the prevalence of ADHD has increased by a similar proportion. Why? Factors that can influence the number of prescriptions for ADHD medication written include GPs being more likely to prescribe such medication due to more positive peer-reviewed articles about its effects, changes in prescription protocols (such as more frequent repeat prescriptions being provided), and more awareness amongst parents and the public about the possible benefit of ADHD medication meaning a higher proportion of people ask for medication1. Further, although NICE guidelines published in 2013 recommended treatment for ADHD with medication as part of a comprehensive treatment programme (including psychological, behavioural and educational support), reductions in funding available for such support may contribute to a higher prescription of medication by GPs as an alternative. All of these factors can lead to a higher number of prescriptions being written, and this means the number of prescriptions does not necessarily align with the number of individuals diagnosed with ADHD. So we need to take a different approach to estimating the prevalence of ADHD diagnoses, by looking at the proportion of actual ADHD diagnoses in the population. However, there are currently no available public health records about ADHD prevalence in the UK. Instead, one useful source of data come from population-based studies, which take a large sample of children (often around 8000-14,000) and estimate the prevalence of ADHD through the percentage of children with parent reports of symptoms and/or ADHD diagnoses. These studies have the benefit of estimating the prevalence of ADHD through a non-referred sample, avoiding the biases arising from estimates reached by only counting the number of children brought to medical attention. One such study conducted by Green and colleagues in 20042 estimated the UK prevalence of ADHD in 5-15 year-olds at approximately 1.5%. (A similar report from 2003 estimated the prevalence in this age group at 2.2%3). A more recent report by Russell et al. (2014)4 based on the Millenium Cohort Study estimated ADHD prevalence in the UK at 1.4%. This estimate came from data collected in 2008-2009 when children were 6-8 years old, and parents reported whether ADHD had been identified by a doctor or other health professional. At face value, these figures are a striking contrast to the prescription data: the parent-report data suggest no increase in ADHD diagnoses (from 2004-2009, at least), in contrast to the yearly increase in Ritalin prescriptions over the same time period. However, it is important to consider that the more recent Millennium Cohort Study figures may slightly underestimate the prevalence of children affected by ADHD: this is because the Millennium Cohort sample children were younger, and more children are likely to be diagnosed when they are older. So whilst it is possible that ADHD diagnoses in the UK have increased, we do not have the data to accurately evaluate this change. As we saw in our previous blog post, data from the US would suggest that growing use of ADHD medication does align with increasing diagnoses, but it is difficult to evaluate this relationship for the UK because we do not have statistics from comparable samples of children at different time points. It is particularly important to verify if the actual number of individuals diagnosed with ADHD has increased to understand whether such a growth in prescriptions stems from more diagnoses, a growing trend to provide medication in lieu of other treatment options, or a combination of the two. But the current wave of Millennium Cohort Study data were recently collected when children were 11 years old, and using these data researchers can assess if more children in the sample have now been diagnosed with ADHD as they have gotten older – so we might have an answer soon. Is the United States disproportionately affected by cases of ADHD, and does this tell us anything about causality? This brings us to our next question: is it really the case that ADHD is over diagnosed in the US relative to the rest of the world, as media discussion often suggests? The geographical distribution of ADHD is important for two reasons. First, consistent differences in the geographical spread of ADHD may offer clues as to its aetiology: possible environmental causation in areas of high rates, and preventative factors in areas of low rates. Second, the worldwide distribution of ADHD informs the debate on whether it stems from cultural factors which make it an ‘American’ disorder – whatever this may mean – in which case we would expect it to be more prevalent in the US than anywhere else. When we look at just the US and UK, it appears that US does have higher diagnosis rate of 6.3% (as reported by Russell et al., 2014). This is the closest estimate using the same sampling methods as the UK figure of 1.4% from the Millennium Cohort Study. However, as pointed out in the Millennium Cohort report by Russell et al., there is an explanation for this: a difference in the measurement of ADHD between the US and UK. When the data were collected the DSM-IV was used in the US, but researchers in the UK from whom the data were collected mainly used the ICD-10. The ICD-10 is more stringent, in which a child must show symptoms in all three dimensions of inattention, hyperactivity, and impulsivity to be diagnosed with ADHD, with no comorbid disorders. The DSM-IV is less stringent in the classification of ADHD, whereby children can be diagnosed with symptoms in one dimension only (such as inattention) alongside comorbid disorders. This difference in relative preference of diagnostic criteria can at least partly explain why the DSM-IV-using US has an epidemic compared to the relative calm of the ICD-10-preferring UK5. When we look at the geographical spread of ADHD across the rest of the world, the figures are particularly striking. A meta-analysis by Polanczyk et al. in 20076 combined 102 studies, comprising data from 171,756 children, to estimate the average prevalence rates reported from samples worldwide in the previous 25 years. This figure was 5.3%. Second, they evaluated whether the US prevalence rates really did exceed everywhere else in the world, relative to Africa, Asia, Europe (excluding the UK), the Middle East, Oceania, and South America. The US rate of 6.2% did not significantly differ from the European rate (4.6%), or the highest rate in South America (11.8%). And importantly, there was no overall association between geographic location and ADHD prevalence rates when the methodology of the studies was controlled for. The figure below shows the prevalence estimates for each region (the bars represent the variability in this estimate). Finally, Polanczyk and colleagues verified that the different ADHD prevalence estimates between the US and Europe in particular were indeed explained by the different diagnostic criteria of the DSM and ICD. They did this by coding for all the methodological features in each study, and found that US diagnoses were more frequently made on DSM criteria, and European diagnoses more so on ICD-10 criteria. Another meta-analysis by Willcutt (2012)7 also found that differences in ADHD prevalence across countries were not significant after diagnostic approaches were controlled for. So these data suggest that ADHD is not disproportionately prevalent in the US; rather, its relative prevalence seems to depend more on the diagnostic tool used. But on an individual level, any parent of a child with ADHD, or any individual with ADHD, is unlikely to attest that their difficulties with learning, concentration and communication are because they are living in Bolivia rather than Finland. The critical ongoing issue is therefore what constitutes our diagnosis of ADHD. In practice, a child is likely to be identified with ADHD because of how their various cognitive difficulties are expressed, and how this expression is interpreted by clinicians. Part of this interpretation may be due to less quantifiable environmental, social and cultural factors: in particular, Conrad and Bergey (2014)8 recognise that the historical approach to ADHD and medication use in a country can greatly influence whether clinicians classify children’s difficulties under the ADHD diagnostic label. But the different diagnostic criteria of the DSM and ICD do play a role. As noted by Russell et al. (2014), children with hyperactive behaviour and social difficulties may be more likely to be diagnosed with autism spectrum disorder in the UK (due to ICD-10 criteria ruling out a combined diagnosis), and ADHD in the US (due to the DSM-IV allowing ADHD to be diagnosed alongside other developmental disorders). It therefore seems that ADHD is not disproportionately prevalent in the US when we take diagnosis methods into account, but that fact that different tools can yield different prevalence rates makes it important to verify what the ADHD diagnostic label is mapping onto. At first glance, quantifying the prevalence of ADHD would suggest counting all children and adults struggling with attention, hyperactivity, and impulsivity and suggesting those individuals reflect the relative rate of ADHD in a particular population. In practise, however, there is no natural threshold between affected and unaffected individuals with ADHD. ADHD can frequently co-occur with other developmental disorders, such as autism spectrum disorder (ASD); in the Millennium Cohort dataset, 24% of the children with ADHD were also diagnosed with ASD. This individual variation supports a dimensional approach to classifying developmental disorders, which considers the extent to which various cognitive difficulties are present rather than a clear-cut diagnostic label. This is critical in deciding how we give children help in the classroom. For example, we have seen previously that children with poor working memory and children with ADHD have highly similar working memory and executive function deficits, indicating that these shared difficulties are not limited to children with ADHD. Further, although an estimated 25-40% of children with ADHD also have dyslexia9, the treatment approaches for ADHD do not usually address reading difficulties, even though these can be a main constraint on a child’s progress at school. The diagnostic label of ADHD thus represents a highly heterogeneous group of children, and what best helps one child with ADHD may not be what best helps another. But one might argue that neuroimaging data suggesting reduced prefrontal cortex activity in ADHD is indicative of a clear group of children who suffer from a specific neurobiological disorder. However, even such neurobiological ‘markers’ of ADHD are present to a varying degree in individuals without ADHD. Shaw et al. (2007)10 reported that the age of reaching peak cortical thickness – a measure of brain maturation, before cortical thinning proceeds throughout late childhood and adolescence – was delayed in children with ADHD relative to typically developing children. This finding suggested that ADHD may reflect a delay in typical brain development, rather than a qualitative difference between children with and without an ADHD diagnosis. And Shaw et al. (2011)11 found that this rate of cortical thinning was related to the degree of hyperactive and impulsive symptoms in typically developing children without an ADHD diagnosis. Children with higher ratings of hyperactive/impulsive symptoms had a slower rate of cortical thinning, similar to what was observed in children with ADHD. These data align with the idea that ADHD may be a disorder that is better understood dimensionally, with those who are affected being at the end of a continuum of inattention and/or hyperactivity symptoms, rather than there being a distinct cut-off between ADHD and ‘typical’ development. How does this inform the question on whether ADHD exists as a developmental disorder? From the evidence above it seems that the label of ADHD does not identify a separate category of children who are inattentive and hyperactive. Rather, what we think of as ADHD is a complex cluster of cognitive and behavioural difficulties which fall on a scale for all children, from unaffected to severe. It is how these difficulties are expressed by children and interpreted by different diagnostic approaches, in different cultural contexts, which determine the cut-off at which a child is diagnosed. Whilst difficult to unpick, these factors may best capture how ADHD is identified and why prescriptions have steadily grown; however, we critically need further data to accurately evaluate ADHD growth in the UK. And on an individual level, the symptoms of ADHD have a substantial impact on the day-to-day lives of those who are affected. It is important we ensure that diagnosis appropriately reflects individual differences between children, and think about how to best to commission education and health services to help affected children and adults. Green, H., McGinnity, A., Meltzer, H., & Ford, T. G., R. (2004). Mental health of children and young people in Great Britain, 2004. Report commissioned by the Office for National Statistics. For interested readers, there is also an excellent timeline here depicting ADHD rates in the US as diagnostic tools have changed from 1970 to the present day. Polanczyk, G., de Lima, M. S., Horta, B. L., & Biederman. J. (2007). 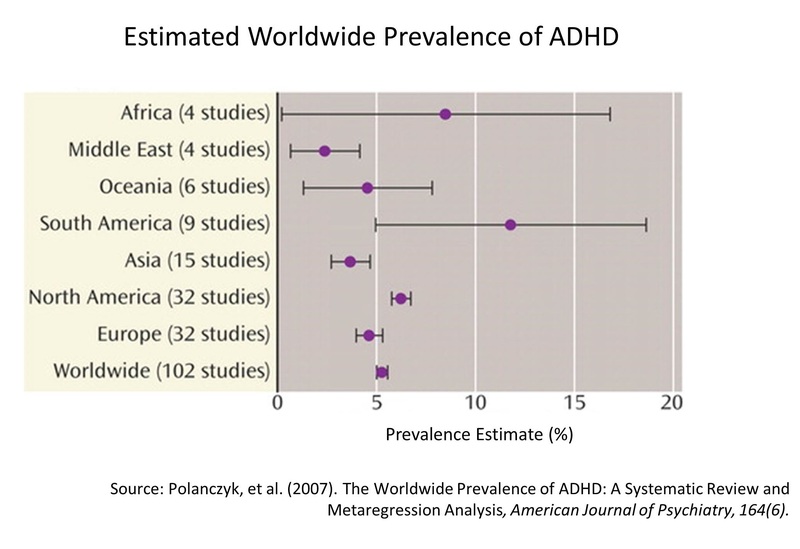 The Worldwide Prevalance of ADHD: A Systematic Review and Metaregression Analysis. American Journal of Psychiatry, 164(6). 942-948. Ritalin and ADHD: What is the story so far? The use of Ritalin to treat ADHD has become a highly contentious issue over the past decade. Part of this contention stems from a marked growth in use, with a 156% increase in the number of Ritalin prescriptions dispensed in England over the last ten years. Another source of contention comes from fragmented information about what the precise effects of Ritalin are (and ADHD medications in general) and what governs whether it is prescribed. We can unpick at least some of this debate by asking two questions: what is the evidence for what Ritalin does, and the extent to which it can help children with ADHD? And why could the number of Ritalin prescriptions have steadily increased over the past decade? Methylphenidate medication in ADHD: What does Ritalin do, and can it help children with ADHD? ADHD is a developmental disorder which, despite having a single diagnostic label, presents substantial individual differences between children who are affected. ADHD is characterised by deficits of inattention, impulsiveness, and hyperactive behaviour. These difficulties are often understood to be tied to reduced functionality of the prefrontal cortex (PFC) in individuals with ADHD. The PFC is important for attentional control and executive functions – a broad term for cognitive functions governing organised and controlled behaviour – and this reduced PFC functionality is suggested to result in the core ADHD symptoms of attentional and behaviour control deficits. However, ADHD also frequently co-occurs with other developmental disorders, such as dyslexia and autism. This means that children who are diagnosed with ADHD will range from those severely affected by difficulties in concentrating and sitting still, to those who struggle to pay attention and have comorbid difficulties in areas such as reading and communication. From the outset it is therefore important to recognise that there is huge individual variation in the children (and adults) whom fall under the ADHD diagnostic umbrella. Ritalin, also known as methylphenidate, is a stimulant medicine which is commonly used to treat ADHD symptoms of inattention and hyperactivity. To understand the effects of Ritalin on cognition, research studies compare performance on tasks when participants have taken Ritalin to when they have taken a placebo. A meta-analysis of these studies by Coghill et al. (2014)1 combined papers investigating the effects of Ritalin in children and adolescents with ADHD. They found that the medication improved short term memory accuracy, working memory capacity, response speeds, and response inhibition relative to a placebo. Because the meta-analysis combined results across at least ten published studies for each aspect of cognition, these results are more representative than findings from a single study. A similar review by Epstein et al. (2014)2 assessed the effects of Ritalin medication in adults with ADHD, and observed that it improved inattentiveness, hyperactivity and impulsive behaviour. These findings overall suggest that Ritalin has positive effects on cognition and controlled behaviours compared to a placebo, in both children and adults with ADHD. A suggested neurophysiological mechanism for Ritalin’s effect on cognition and hyperactivity is via increased functionality of the prefrontal cortex (Spencer et al., 2015)3. Ritalin prevents the reuptake of the neurotransmitters dopamine and norepinephrine in the PFC. Because these neurotransmitters allow nerve cells to communicate, their increased levels in the PFC strengthen its signalling and therefore improve its functionality. This increased activity of the PFC is measured in studies using fMRI, and is suggested to be tied to Ritalin’s effects of improving PFC-dependent cognitive skills such as attentional control, working memory, impulse control, and organised behaviour (Berridge & Devilbiss, 2011)4. Importantly, however, these effects do not mean that the Ritalin treats the causes of ADHD. A key piece of evidence comes from the finding that Ritalin has the same ‘cognition-enhancing’ effects on individuals without ADHD. A review by Linssen et al. (2014)5 found that when adults without ADHD were given Ritalin their performance improved on tests of working memory and processing speed, and to a lesser extent attention and vigilance. Whilst these data do not allow us to assess if the magnitude of these methylphenidate effects were statistically identical to those in individuals with ADHD, they are an important indicator that Ritalin can improve these cognitive markers irrespective of an ADHD diagnosis (as current American college trends may also attest). These findings suggest that whilst Ritalin can be beneficial, it does not operate on the root aetiology of ADHD. But interestingly, despite the cognitive benefits measured in short-term studies, Ritalin does not seem to improve children’s academic achievement in the long term. A large-scale longitudinal study reported by Molina et al. (2009)6 assessed the long-term outcomes of 579 children with ADHD who were randomly allocated to one of four treatment groups: methylphenidate medication, behaviour therapy, combined medication and behaviour therapy, or community care. At the end of the fourteen-month treatment period, all groups had improved relative to their pre-treatment baseline on a range of outcomes including parent and teacher-rated ADHD symptoms, teacher-rated social skills, and reading and maths achievement. Interestingly, the greatest improvements were for the medication group and combined medication plus behaviour therapy group. At the first follow-up ten months after treatment, the initial advantage of the medication and combined groups was still present (although the magnitude of this effect was about half what it had been immediately after treatment). However, when the children were followed up several years later, this added benefit of medication had levelled out. At the three-year follow-up the four treatment groups remained above their pre-treatment baseline, but there was no difference between the treatment options; that is, the relative advantage of the medication groups was no longer present. After eight years the groups continued to perform above a pre-treatment baseline, but there remained no differential treatment benefit of medication. These findings suggest that medication can have a benefit during a relatively short-term treatment period, but beyond this initial treatment there is no evidence for a lasting medication advantage for the majority of children. It is particularly interesting that there was no evidence for medication specifically improving long-term academic attainment in light of its short-term improvement of attention, short-term memory, and working memory. Because we know these cognitive skills are significant predictors of educational outcomes, we might have expected their improvement with Ritalin to also boost educational outcomes. Of course, the reason for no longer-term effects of medication may simply be that it can improve cognitive control during treatment, but these effects of the drug do not continue to have additive benefits after treatment is discontinued. There is also relatively little existing research on the effects of taking Ritalin for a longer time period, which limits our understanding of its effects from longer-term use. However, another interesting explanation for the lack of such an effect may come from the heterogeneity of children diagnosed with ADHD. In their report Molina et al. (2009) identified three subgroups of children in the three-year follow-up, each with different ADHD trajectories as a result of treatment. One group showed an increasing steady benefit of medication use over three years; a second group showed a very large initial benefit for medication use which then plateaued, and was maintained three years after treatment; and a final group returned to pre-treatment levels with no ongoing benefit of treatment. These different profiles of children continued to be associated with their performance on the outcome measures of cognitive, social, and academic attainment at the eight-year follow-up. Importantly, these findings suggest that children’s longer-term outcomes may be determined more by their individual profile of symptoms than the specific type of treatment they receive. So overall, what do these data us about the decision to use Ritalin for individuals with ADHD? Whilst research studies conducted over the short-term indicate that Ritalin can improve aspects of controlled cognition such as working memory and attention relative to a placebo, there is no evidence that medication continues to have an added benefit to non-medication treatments (such as behavioural therapy) after about two years following the start of treatment. The varying effects of medication may come from the heterogeneity of children diagnosed with ADHD. For many children, comorbid difficulties with reading or communication, for example, could be a key limiter on their performance at school, which Ritalin may do little to redress. Although Ritalin can undoubtedly be beneficial for children who substantially suffer with attention or behavioural control difficulties, the fact it is not universally helpful is an indicator of how much children diagnosed with ADHD can differ in their profile of strengths and weaknesses. Importantly, the effects of medication may therefore depend more on the symptoms of an individual child than the presence of an ADHD diagnosis. 156 percent: What are the reasons behind growing Ritalin use? A herein lies the controversy: despite the above findings, and an anecdotal lack of consensus about its effects, the number of Ritalin prescriptions dispensed in England increased by 156% between 2004 and 2014. These data, published by the Health and Social Care Information Centre in 2015 and shown on the figure below, show Ritalin prescriptions at 359,068 in 2004 and 922,206 in 20147. (Interestingly, whilst the HSCIC data show that prescriptions for Ritalin are of a larger quantity than the other ADHD medicines on the market, the average use of other ADHD medicines also increased by a modest 136%). But could it just be the case that all prescriptions have increased this much in general over the last decade? No; the average number of prescriptions dispensed across England rose by 55.2% over the same ten-year period. This discrepancy prompted the National Institute for Health and Care Excellence (NICE) to release guidelines in 2013 that initial treatment of moderate ADHD should not include methylphenidate medication, prompting substantial debate as to what constituted ‘moderate’. So whilst it is agreed that the prescription of ADHD medication has grown substantially, there is no consensus on what is driving this change. What reasons could there be behind a growing number of Ritalin prescriptions? One obvious reason is an increase in the number of children (and adults) diagnosed with ADHD. In the United States at least, this argument for a relationship between prescription rates and ADHD diagnoses seems to hold. The Centre for Disease Control and Prevention collected comprehensive data on the percent of 4-17 year-olds with parent-reported ADHD diagnoses in each state, and the percent of children taking ADHD medication in each state, in 2007 and 20118. These data mean we can look at whether there is a relationship between each state’s change in ADHD diagnoses in this period, and their simultaneous change in medication use. 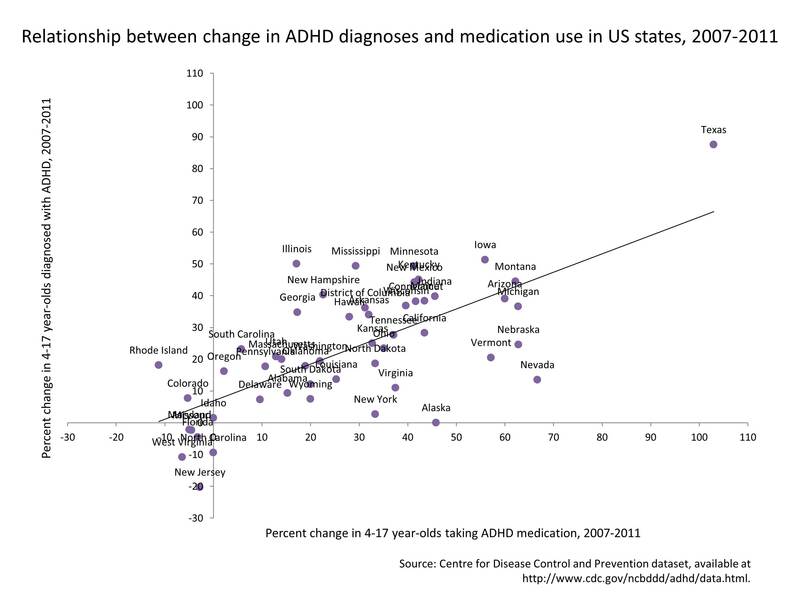 The figure below shows the relationship between the change in the percentage of children with ADHD diagnoses and percent of children taking ADHD stimulant medication in each state, and there is indeed a significant positive correlation between the two. This positive correlation means that states with a larger increase in ADHD diagnoses also had a larger increase in the number of children prescribed stimulant medication. Whilst we cannot infer causality from these data (that is, we cannot assume that more ADHD diagnoses cause more medication prescriptions) they do suggest that the growth in diagnoses and prescriptions are related. The main question these data raise – apart from what is going on in Texas – is why ADHD diagnoses have increased. In a recent paper investigating reasons behind the global expansion of ADHD diagnoses and medication use, Conrad and Bergey (2014)9 suggested that increased promotion of ADHD drugs by the pharmaceutical industry, the increased adoption of DSM (the Diagnostic and Statistical Manual of Mental Disorders, an American publication) diagnostic criteria, and more accessible information about ADHD online could all contribute to its steady growth. ADHD information being more visible and accessible online can prompt more individuals to seek and thus obtain a diagnosis, and promotions by pharmaceutical companies can result in medication treatment being more frequently offered to individuals diagnosed with ADHD. Further, the diagnostic criteria used are particularly important: Conrad and Bergey suggested that a shift towards the DSM criteria in the 1990s contributed to increasing rates of ADHD, as the DSM uses a lower threshold for diagnosis and allows the co-occurrence of ADHD with other developmental disorders. Whilst these are broad brush strokes for reasons for which Ritalin use has grown, they nonetheless suggest possible mechanisms for the increase in prescriptions. However, it is important for us to recognise that measuring the number of prescriptions dispensed may not be the best indicator of how many individuals are actually taking the medication. A good example of this comes from looking at the headline finding from a 2008 study which reported huge variation in the number of Ritalin prescriptions dispensed across England, with as much as a ­23-fold difference between the lowest and highest-prescribing areas of the UK (Stoke-on-Trent and Wirral, respectively). However, the prescription rate for each region was measured by the number of prescriptions dispensed as a proportion of the population in that region. These figures meant that differences in prescribing practises across regional primary care trusts, such as the standard frequency of repeat prescriptions, could contribute to a lot of this variation. The overall population of a region also influenced its ‘rate’ of prescribing; this might explain why the relatively small Isle of Wight had the second-highest rate at 107 prescriptions per 1000 children. Although just one example, this points to the need to look at Ritalin use in terms of the number of individuals prescribed Ritalin and ask how this aligns with the number of individuals actually diagnosed with ADHD. So the story about Ritalin seems to have two parts: first, it can have beneficial effects on cognition, but these benefits may critically depend on children’s individual profile of symptoms. Second, it is possible that Ritalin use has increased in line with growing ADHD diagnoses, but we need to carefully evaluate the evidence we have to assess this. Possible vehicles for growth include more individuals seeking a diagnosis due to the information now available about ADHD, promotion by pharmaceutical companies for the use of medication, and a shift in diagnostic criteria meaning a higher proportion of people are identified as having ADHD. In the UK, however, we know relatively little about how increasing Ritalin use relates to the number of individuals with ADHD taking medication, and the wider growth of ADHD as a disorder. This is the question we will turn to in our next post. The researchers measured medication prevalence by the number of individual children who were prescribed ADHD medication, rather than the number of prescriptions being written.